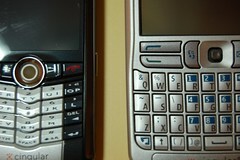 My first smartphone was a Siemens SX-1, a Symbian Series 60 variant. This was a great GSM phone for check emailing and listening to music. So I jumped at the opportunity recently to spend time with one of the latest Series 60 phones, the Nokia E62. I had high hopes for the Nokia E62. When I first saw the phone during its prerelease period, I thought it could truly be the often talked about but yet to be produced “BlackBerry Killer.” Plus its WebKit-based browser has some of the sames feature found in the Apple iPhone. Any idea if PGP Mail signing is available for the Nokia E62? I just got one, and have been googling like mad for some PGP help, without much luck. I would LOVE to find a PGP Mail program for my new E62, as I live by PGP signed mail! No, PGP email and/or device encryption is not available for Symbian. I’d rather have GnuPG … Maybe I should work on it myself. PGP Corp has lost my business forever. GnuPG rocks. This was posted by Kevin Bocek on Friday, March 23rd, 2007 at 22:39. Bookmark the permalink.